The other day in the market I spied the cutest little slider buns I’ve ever seen. They are baked by my favorite bakery, Macrina, and here’s the best part – they are brioche sliders. I quickly tossed a bag in to my basket knowing they would be the perfect vehicle for something tasty. With the Super Bowl approaching this weekend, I’ve been pondering snacks and finger foods. Football is popular in our house (we have some very loyal Seahawks fans) and we’ll be watching the game. A lot of game day food tends to lean towards the heavy, cheesy and fried (and delicious) so I decided to create something on the lighter side to balance out the fare a bit. 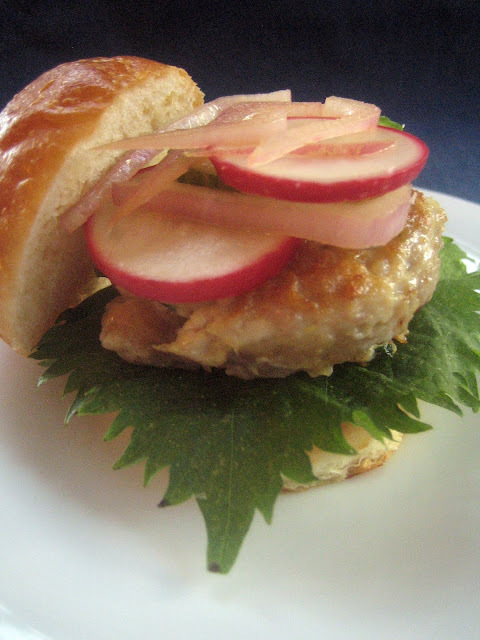 Fresh tuna burgers are always a favorite, especially when infused with garlic, ginger, soy and chile. 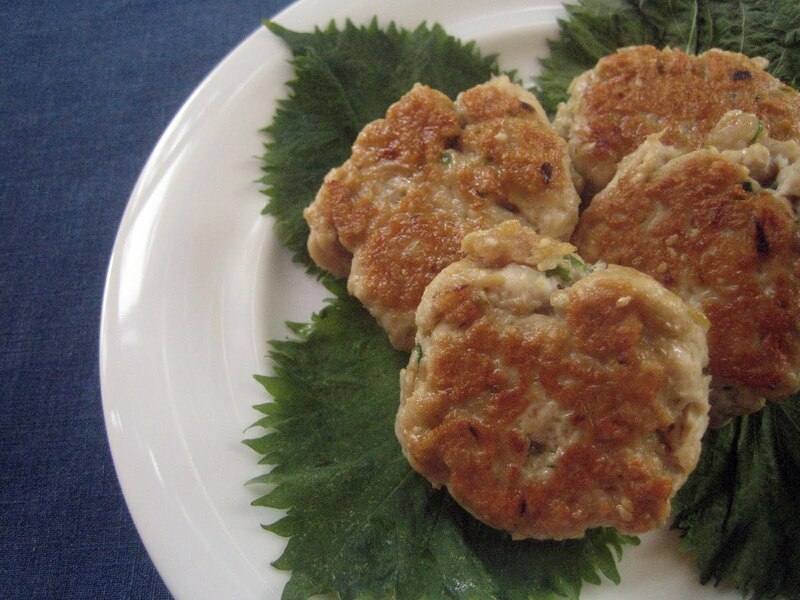 After blending everything together in the food processor, the tuna patties can easily be shaped and cooked small enough to slip inside slider buns. In place of lettuce and tomatoes, I topped these juicy morsels with some quickly pickled shallots, radishes and cucumbers and pretty shiso leaves. Shiso has a strong herbal flavor and a unique taste, rather like basil, cilantro and pepper together. In fact, shiso is sometimes called Japanese basil and is a member of the mint family. If you don’t have access to shiso leaves, then lettuce or another leafy herb such as basil could be used. Combine the ginger, garlic, chile, green onion and sesame seeds in the bowl of a food processor and until well chopped and combined. Add 3 tablespoons soy sauce, vegetable oil and the tuna and pulse about 15-20 times until blended together (do not over process – it does not have to be smooth). Scrape the tuna mixture into a bowl, cover and chill for about half an hour to let the flavors blend (can be prepared in the morning and kept chilled until ready to use). In a small bowl, whisk together the mayonnaise and 1 teaspoon soy sauce. Set aside. In another small bowl, stir together the rice wine vinegar, remaining 1 teaspoon soy sauce and red wine vinegar. Add the shallots, radishes and cucumber slices in and stir to coat. Set aside (can be prepared ahead and sit at room temperature). Lay out an assembly line of the slider buns. Slather a bit of the soy-mayo mixture on the bottom slices of the buns. Lay a shiso leaf on top of each. Remove the tuna from the fridge and divide it in 8 portions. Shape each portion into a small patty about 2 inches across. In a large skillet, warm a drizzle of olive oil over medium heat. Add the tuna patties and cook for about 3-4 minutes, until nicely browned. Flip and cook for a couple of minutes on the other side. We like our tuna on the rare side, and the patties will continue cooking when you remove them from the pan so don’t leave them too long. Place a tuna patty on each prepared bun bottom. 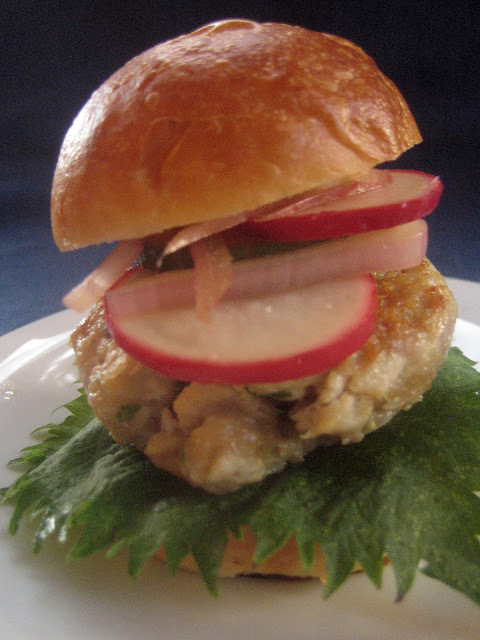 Scatter some pickled shallots, radishes and cucumber slices on and pop the top buns on. Serve and enjoy. Thank you, Ruth! I think a veg version of this would be quite good with marinated/grilled tofu using the same flavors of ginger, soy and chile. Ooh, these look so good. Where do you get the shiso leaves? Thank you, rowdy chowgirl! I picked up shiso leaves at the Ballard Market. I think Uwajimaya or HT Market would probably have some, too. Brioche sliders! What a delightful idea. I have to say, I frequently envy all your Seattle food resources! I am really liking the looks of those quick pickles. 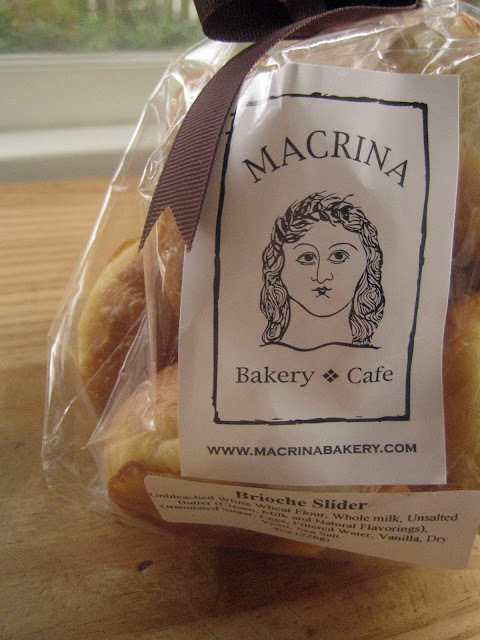 I've seen Macrina bread in the grocery store, but didn't know they had cafes! Yuuummmm! Thanks, Brooke! Oh yes, Macrina has cafes - brunch at the Belltown spot is divine (I recommend the fried egg sandwich and the bread pudding...and anything else on the menu!). I love all the recipes I discovered at your blog hop! 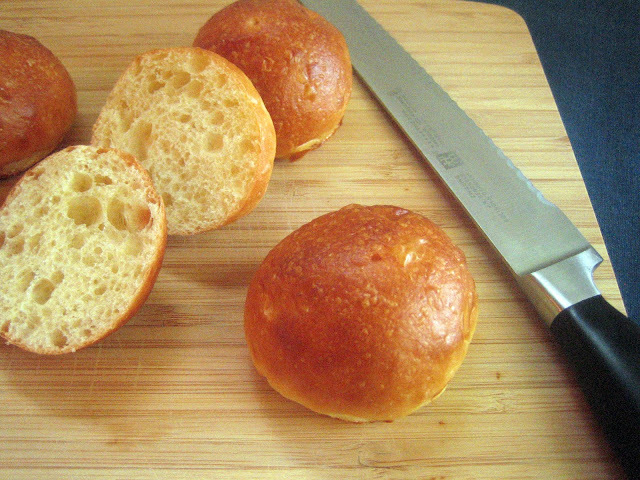 I've seen broiche slider buns before...but the ones you found look exceptional, so golden-brown and pretty and airy! The sliders look just perfect for a party, yum. Thank you, Joyti! The slider buns were both pretty and delicious - definitely the nicest I've ever seen. Very yummy - perfect finger food. They look really good. These look wonderful, Hannah! I also wanted to let you know I awarded you the Liebster Award on my blog today in my most recent post. Just one more way to let you know how much I enjoy your blog!! Tasty. Congrats on the Liebster Blog award! I found almost the same little buns, love sliders, yours are fantastic. Your photography is beautiful, so glad I found this blog. Thanks to the wimpy vegetarian!! Thank you, Suzanne! It's so nice we can all connect through food. Thanks for stopping by! Thank you so much, Mairi! I'm thinking up new ways to fill the brioche buns since I won't be able to pass them by at the market.